consistency. The data a session is viewing or changing must not be changed by other sessions until the user is finished. and integrity. The data and structures must reflect all changes made to them in the correct sequence. among transactions through a locking mechanisms. performed automatically and requires no user action. directly associated with a session. or system objects not visible to users, such as shared data structures in memory and data dictionary rows. Oracle Database automatically obtains and manages necessary locks when executing SQL statements, so you need not be concerned with such details. However, the database also lets you lock data manually. A lock is a mechanism that prevents destructive interactions, which are interactions that incorrectly update data or incorrectly alter underlying data structures, between transactions accessing shared data. Locks affect the interaction of readers and writers. A reader is a query of a resource, whereas a writer is a statement modifying a resource. A row is locked only when modified by a writer. When a statement updates one row, the transaction acquires a lock for this row only. By locking table data at the row level, the database minimizes contention for the same data. Under normal circumstances the database does not escalate a row lock to the block or table level. A writer of a row blocks a concurrent writer of the same row. If one transaction is modifying a row, then a row lock prevents a different transaction from modifying the same row simultaneously. A reader never blocks a writer. Because a reader of a row does not lock it, a writer can modify this row. The only exception is a SELECT ... FOR UPDATE statement, which is a special type of SELECT statement that does lock the row that it is reading. A writer never blocks a reader. When a row is being changed by a writer, the database uses undo data data to provide readers with a consistent view of the row. The less restrictive the level, the more available the data is for access by other users. Conversely, the more restrictive the level, the more limited other transactions are in the types of locks that they can acquire. The Exclusive lock mode prevents the associated resource from being shared. A transaction obtains an exclusive lock when it modifies data. The first transaction to lock a resource exclusively is the only transaction that can alter the resource until the exclusive lock is released. The Share lock mode allows the associated resource to be shared, depending on the operations involved. Multiple users reading data can share the data, holding share locks to prevent concurrent access by a writer who needs an exclusive lock. Several transactions can acquire share locks on the same resource. Thus, the database permits as many statements as possible to execute. Oracle Database performs lock conversion as necessary. In lock conversion, the database automatically converts a table lock of lower restrictiveness to one of higher restrictiveness. For example, suppose a transaction issues a SELECT ... FOR UPDATE for an employee and later updates the locked row. In this case, the database automatically converts the row share table lock to a row exclusive table lock. A transaction holds exclusive row locks for all rows inserted, updated, or deleted within the transaction. Because row locks are acquired at the highest degree of restrictiveness, no lock conversion is required or performed. Lock conversion is different from lock escalation, which occurs when numerous locks are held at one level of granularity (for example, rows) and a database raises the locks to a higher level of granularity (for example, table). If a user locks many rows in a table, then some databases automatically escalate the row locks to a single table. The number of locks decreases, but the restrictiveness of what is locked increases. Oracle Database never escalates locks. Lock escalation greatly increases the likelihood of deadlocks. Assume that a system is trying to escalate locks on behalf of transaction 1 but cannot because of the locks held by transaction 2. A deadlock is created if transaction 2 also requires lock escalation of the same data before it can proceed. depending on the resource and the operation being performed. Oracle Database locks are divided into the following categories. DML Locks. Protect data. For example, table locks lock entire tables, while row locks lock selected rows. DDL Locks. Protect the structure of schema objects—for example, the dictionary definitions of tables and views. System Locks. Protect internal database structures. run the change late at night when the database is idle. Do all DDL during a maintenance window with all end-users locked-out. Kill the sessions that are preventing the exclusive lock. catblock.sql, creates the lock views that utllockt.sql needs, so you must run it before running utllockt.sql. utllockt.sql script displays, in a tree fashion, the sessions in the system that are waiting for locks and the locks that they are waiting for. The location of this script file is operating system dependent. The base table for all locks is the V$LOCK view. In most cases, the database holds locks acquired by statements within a transaction for the duration of the transaction. Oracle Database releases all locks acquired by the statements within a transaction when it commits or rolls back. Oracle Database also releases locks acquired after a savepoint when rolling back to the savepoint. There are dozens of lock types, but the vast majority are system types. System locks are normally only held for a very brief amount of time. TX. The TX lock is a row transaction lock; it's acquired once for every transaction that changes data, no matter how many objects you change in that transaction. The ID1 and ID2 columns of V$lock point to the rollback segment and transaction table entries for that transaction. TM. The TM lock is a DML lock. It's acquired once for each object that's being changed. 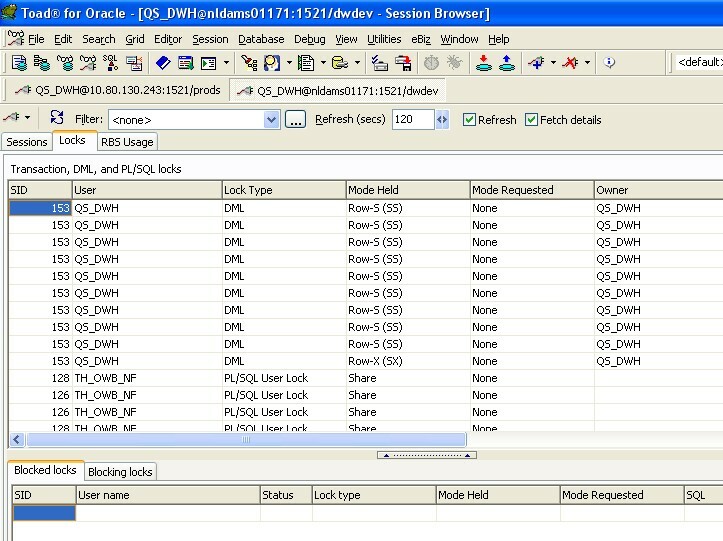 The ID1 column of V$lock identifies the object being modified. and UL. UL is a user-defined lock – a lock defined with the DBMS_LOCK package.